I usually have several topics twirling in my head the days before my bimonthly post is due. I’m never sure which direction I am going until the last minute. Then I wanted to write about my good friend, who finally decided to lose weight and succeeded. I had been worried about her for a while as she struggled with chronic health issues that now have moderated with dropping extra pounds. She can walk up a flight of stairs without losing her breath. And best of all, her thoughts on future living options have been revised from an assisted living facility to an independent apartment. The gerontological nurse practitioner in me cheers. I also thought of mentioning something about Nurses Week: May 6 to May 12. But I am having conflicting thoughts about the purpose and relevance of this celebration. So much so that I decided to spare you my rantings. I remember all the ballyhoo about the Golden Girls, which premièred in 1985 starring Bea Arthur, Betty White and Rue McClanahan. They were advertised as older, racy free spirits, behaviors inconsistent with their age. So I thought they were ladies in their 80s. I was absolutely shocked that Arthur and White were 63 and McClanahan was only 51. That was NOT old! This time the cast really is older. 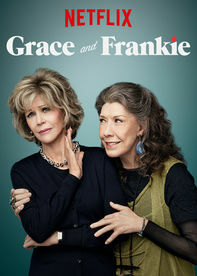 The two female leads, Jane Fonda and Lily Tomlin, are 77 and 75, respectively. The men in the series, Martin Sheen and Sam Waterston, are both 74. Finally, we have a show that aims to reach older viewers. What I do hope is that it catches the attention of a younger audience so that they can watch a program with an older cast, which doesn’t center on disability, dementia and constipation. I hope you find time to check the show out for yourself. PRIMARY CARE PROVIDER: MD OR NP? Hi Marianna…. What a lovely article. I’ve never been ‘blogged’ about before. I’m so glad you are enjoying your cell phone necklace. It is always a huge excitement for me to make a new item from scratch that is pratical, functional and to the customer’s approval and satisfaction. Too bad I don’t get Netflix. I bet we could do a comedy show together, though. I remember quite a while ago at at nursing conference two nurses teamed up to do a comedy routine. Mmmm.